Well, it had to happen. This is the internet and EVERYBODY is selling something and that includes your humble finder of free fiction. 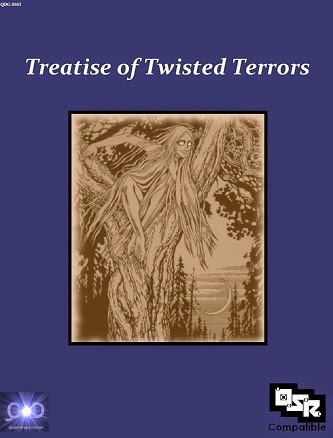 The Treatise of Twisted Terrors is an unofficial book of monsters for "old school renaissance role-playing games" and can be used with any old school RPG or modern clones. It's a 90 page PDF (roughly 3 megabytes) and only $2 at DriveThruRPG and RPGNow. More info is available at QuasarDragon Games and the "Full-size preview" option is available at both sellers. However, in keeping with the QD spirit of freeness, loyal QuasarDragon readers and potential reviewers can receive a free copy. Just e-mail me at david-tackett@hotmail.com and I'll have a free copy sent to you from DriveThruRPG. I'm not completely certain how the process works - I think they send you a code that you redeem on the site. Feel free to let me know after you receive your copy.